I just love the look of pure joyous excitement on the face of the bride during the ceremony recessional at this Chateau Malliac wedding. 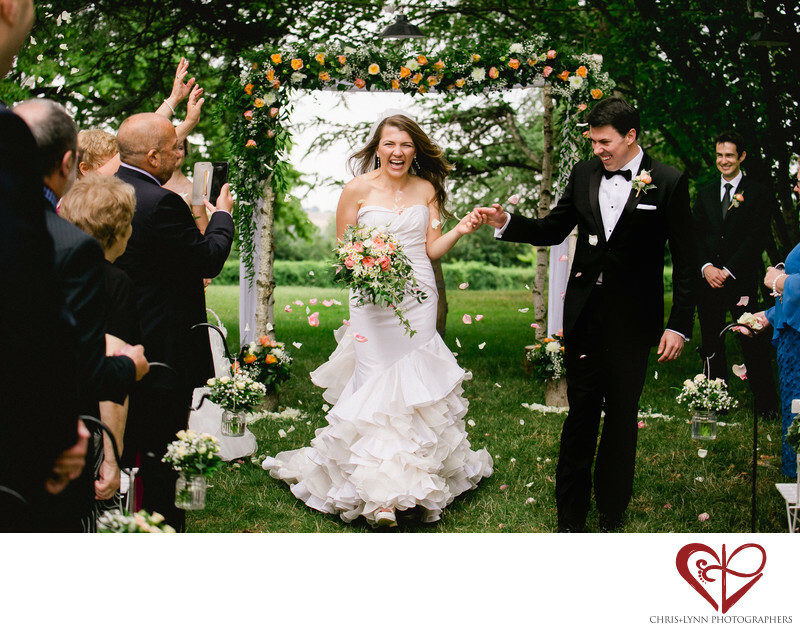 One incredibly easy way to make your ceremony photographs instantly more fun and memorable is to arrange to have guests throw flower petals, rice, confetti or even blow bubbles during the recessional as you make that first trip down the aisle as husband and wife! There is just no better way to instantly create joy in a photo! "Dan and I wanted to find a beautiful but not overly grandiose chateau with a lot of character and a great story (the history of Malliac itself is closely interlinked with ancient history of the Gascogne region, and it also used to be a prominent Armagnac distillery). Malliac was perfect – it is stunningly beautiful, but in a very natural and non-imposing way, and all the details inside the chateau (such as antique furnishings from 19th century, a library of books throughout the chateau, and a grand piano by the fire place in the living room) exude history and attention to detail. The place was so gorgeous, there was very little decorating we had to do! Instead, we focused on making sure that our friends and family have fun, get to know each other and get to know this little corner of France that we found to be so wonderful." 1/2000; f/4.0; ISO 800; 70.0 mm.